Do you find it hard to get motivated to workout and exercise? Do you think that it takes a lot of time to exercise and see results? The truth is you do not have to work out like crazy or commit to several days a week to get results. You just have to be consistent and find a program that works for you and learn to live a better lifestyle too. Too many good intentioned people jump into a new fitness routine with everything they have, but the reality is this often leads to them getting stressed out, feeling frazzled at the amount of time it is taking each day, they get overwhelmed and lose interest just as fast as they started the program! The ideal way to achieve success at your fitness goals is to integrate a workout routine “into” your lifestyle by setting smaller and very specific goals with the mindset to reach each one at a slow and steady pace. Taking this approach has a proven success rate and keeps people interested in living a healthy lifestyle for the long term. My workouts are only three to four times per week for 30-45 minutes each. I design all of them to be fast, effective and to fit my busy lifestyle, except for my Barre class which I do once per week for one hour, I LOVE this class, it challenges me to go to different levels and has a great group of women that teach and take the class! I get my cardiovascular in on the elliptical, stationery bike or just within my workout routine by increasing the tempo of the circuit I am doing. 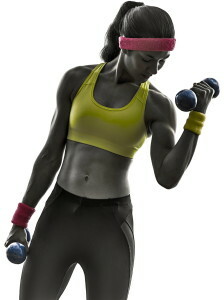 I always strength train with the right amount of weight to be effective, work my core and do balance exercises too. Get Motivated To Workout! Set up a specific workout designed to fit into your life not complicate it! If you need help contact us at Fit, Healthy and Fabulous we will design a program that will work for you and your schedule, one that will keep you accountable and on track too! This entry was posted in Exercise, Fitness, Workouts and tagged Fitness Tips NJ, Personal Trainers in Ridgewood NJ, Personal Training in Bergen County NJ, Workout Motivation.